Apple continues to shape the future of healthcare. Improved heart monitoring. The Apple Watch already performs basic heart-monitoring with Cardiogram (In fact, according to Williams, the Apple Watch is the most-used heart rate monitor in the world.) 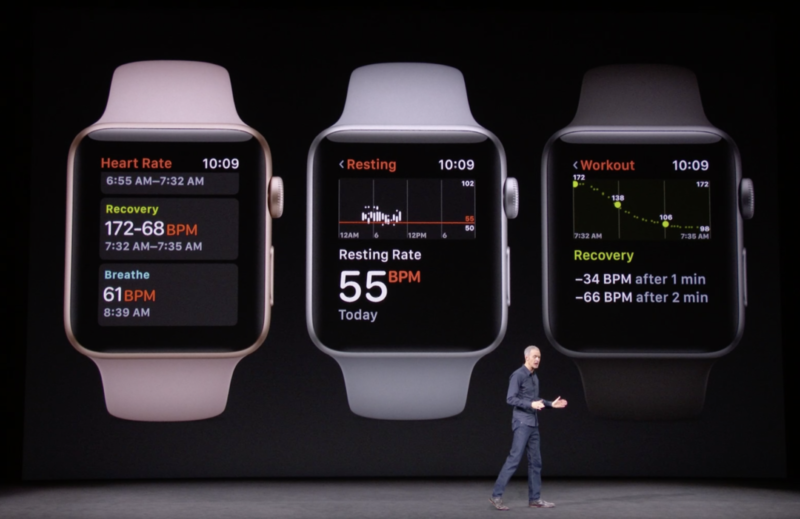 But with watchOS 4 (available September 19), Apple Watch will also report resting heart rate and recovery heart rate (the latter metric tells you how quickly your heart rate drops after a workout). As Williams said, a lower resting heart rate and a quicker recovery rate can be signs of improved fitness. Alerts on elevated resting heart rates. 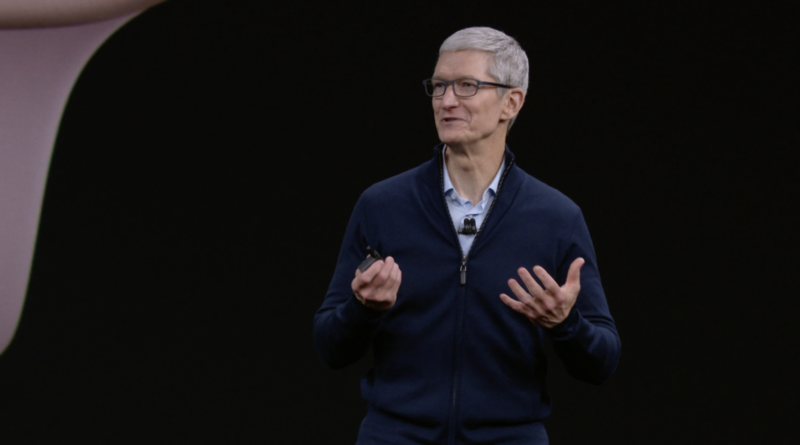 Williams noted that many Apple customers wrote to Apple about how their Apple Watches helped them detect unusually high heart rates at unexpected times. So the Apple Watch now notifies owners when the device detects an elevated heart rate and the owner does not appear to be active — thus alerting the watch owner about potential heart problems. Better support for your workout. For example through the GymKit technology platform, watch OS 4 will make it possible for people to sync fitness data between their Apple Watches and cardio machines they use at the gym, thus delivering more accurate fitness information such as calories burned or distance traveled during your workout. The sync feature will only work with newer pieces of gym equipment — so that functionality might be limited. Apple also announced that the company is working with Stanford Medical Center to determine whether the Apple Watch can accurately detect abnormal heart rhythms, or arrhythmias. 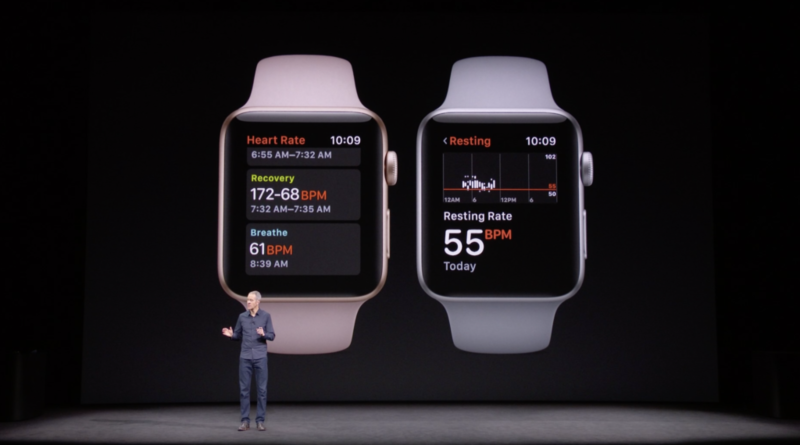 As noted by Jessica Conditt of Engadget, Apple would like for the Apple Watch to be able to detect common – but often undiagnosed — heart conditions such as atrial fibrillation. According to a study done by Cardiogram and the University of California, San Francisco, the Apple Watch already detects the most common type of heart arrhythmia with a 97 percent accuracy rate. With the Apple Heart Study, Apple will manage its own research with Stanford Medical Center. To try and better detect, diagnose and then in turn treat these irregular heart rates, Apple will anonymously send health data from participants through its HealthKit SDK straight to the research team at Stanford Medicine. Just like the previous studies on dementia, Apple’s HealthKit allows research teams the rare chance to gather huge sample rates of data while still making sure that all the data is anonymised. The Apple Heart Study will be an app that users in the US can download for free onto their Apple Watches and it will simply run in the background. The first phase of the study will be available later in 2017 on the app store. These developments are part of Tim Cook’s vision to make Apple a healthcare market maker. Market makers do more than sell products. They change the way people live. And Cook sees healthcare as a way for Apple to effect long-lasting change in how people and companies use data to manage health. Software for patients and providers to monitor and share data, which is where apps such as HealthKit come into play. 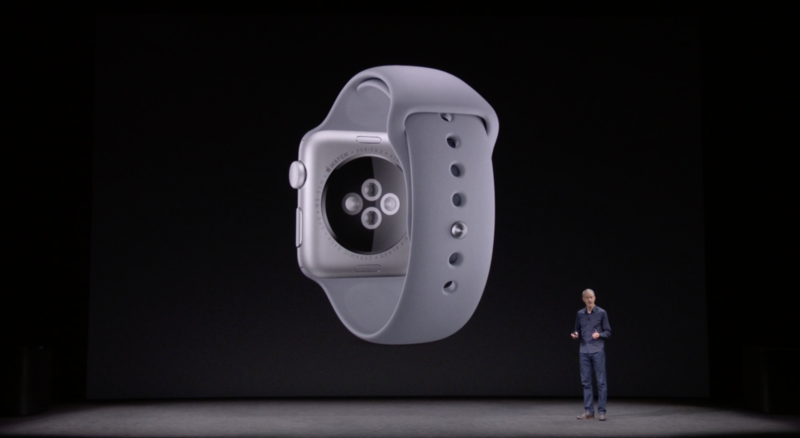 The September 12 special event underscored this strategy especially with software and the Apple Watch. Cook has good reason to focus on healthcare, especially wellness and fitness, or initiatives to keep people healthy. The PwC’s Health Research Institute (HRI) cites wellness care as one of the top forces shaping the future of healthcare industry, with wellness accounting for $276 billion of the $5 trillion U.S. healthcare ecosystem. And a recent study by Technavio says that the global heart rate monitoring device market to grow at a compound annual rate surpassing 13 percent during the forecast period 2016-2020 as people become more comfortable using wearables to monitor their health in order to avoid costly medical treatment for health problems. One of the things that we’ve learned that we’ve been really surprised and delighted about is [the Apple Watch], because of the monitoring of the heart, has essentially alerted people through the collection of the data that they have a problem. And that spurred them to go to the doctor and say, ‘Look at my heart rate data. Is something wrong?’ And a not-insignificant number have found out if they hadn’t come into the doctor they would have died. The future of healthcare is here. And Apple has helped to create that future. This entry was posted in Apple, Digital and tagged Apple, Apple Heart Study, Apple Watch, David Deal, GymKit, HealthKit, Internet Trends Report, Jeff Williams, Mary Meeker, Superhype, Tim Cook. Bookmark the permalink.